This was my meal, fried chicken on a garden salad. I was trying to be healthy and eating light because I had to go play netball later than night. We were also surprised by a complimentary bowl of miso (i think) soup. However, most of us were already very full, so we passed it off to our bottomless pit of a friend who ate it all. You might be thinking 'but Marlee, you only had some chicken and a garden salad, how can you be full?" Well, I may or may not have ordered 3 drinks. I couldn't decided between iced chocolate, grape fanta and green tea so I just decided to order all three. Plus a glass of water. Only problem was I thought the grape fanta would be normal grape fanta, but it wasn't. It was this weird fermented milk grape fanta which tasted pretty much the same, just a bit thicker and milkier. I still drank most of it. 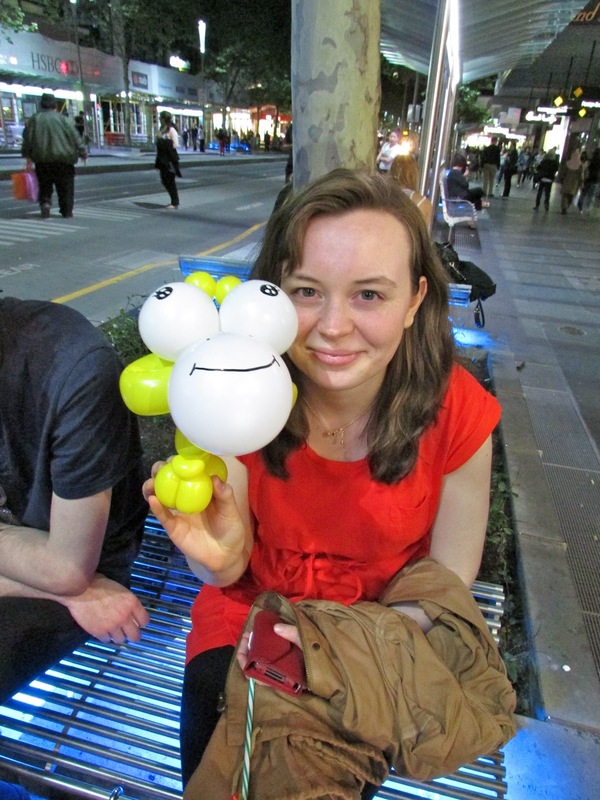 After Yayogi we spilled out onto the street and found a balloon artist sitting right out the front of the restaurant. So of course we had to buy one for my friend as a present. We then made our way to Little Lonsdale Street to a tiny little bar called Little Peninsula. We hung around there for a while but soon I had to go to netball. I definitely need to do things like this more often. Uni and exams will be finished soon so hopefully I can reclaim my life a bit after that. there's an abundance of them in Melbourne!